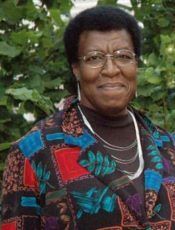 Octavia Butler died at the age of 58 in 2006. At the time of her death, she’d published 16 books, with another volume of uncollected stories published posthumously. The author of several acclaimed science fiction and fantasy novels, most notably Kindred and The Parable of the Sower, her reputation has only grown in the twelve years since her death. While a collection of interviews was published in 2009, very few audio conversations exist today. Richard Lupoff and Richard Wolinsky conducted two of those conversations. The first, early in her career in 1983, was uploaded as a Radio Wolinsky podcast in May, 2017. The interview, recorded in NoTvember 1998, came on the heels of the publication of “Parable of the Talents,” a sequel to “Parable of the Sower.” There’s little question from this interview that not only was she a great writer, but she also predicted the politics of today in a way that seems utterly uncanny. There’s a reason people are going back to her books, and her reputation continues to soar. An extended version can be found as a Radio Wolinsky podcast.